A Motor City, Berlin, London hybrid, Ryan Crosson is a complex artistic creature. Equalparts energetic, down to earth Detroit native and ultra-refined, musical aesthete, Ryan has one ear to the club and one ear far, far beyond. Known the world over for shape shifting, shoulder shaking tracks on groundbreaking labels including Wagon Repair, M_nus, Spectral Sound, and his own Visionquest, Ryan’s production and sampling practices depart from the worlds of house or techno by referencing musique concrète, Downtown New York funk, and East African jazz. Born and raised on a steady diet of post-apocalyptic landscapes, dark warehouses, and the sounds of Plastikman, Matthew Dear, Magda, and Villalobos, Ryan’s DJ sets expand the horizon of possibility without sacrificing dance music’s core element of sweaty, hedonistic fun. 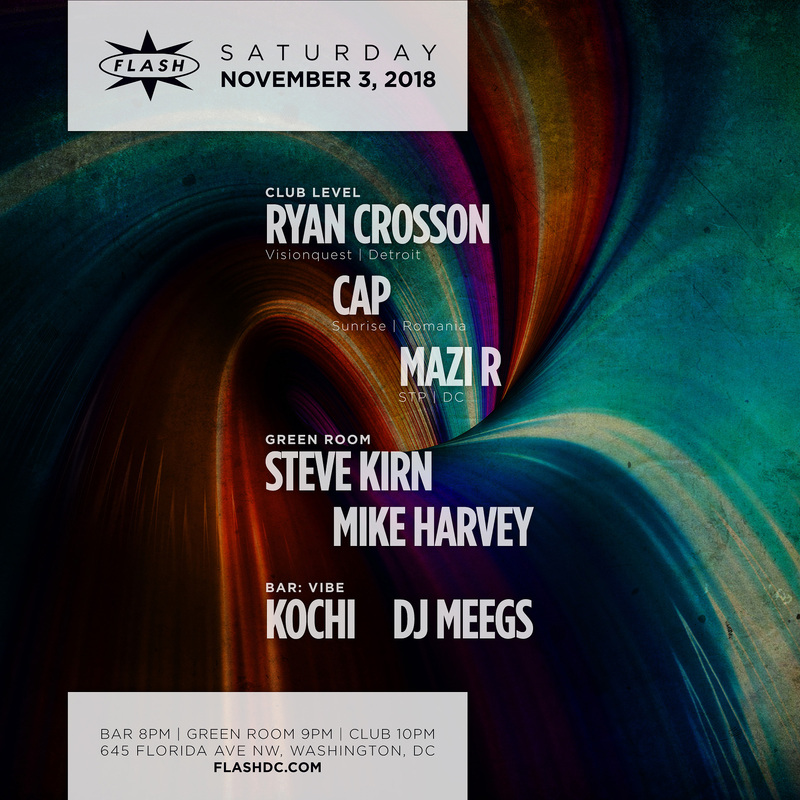 His unique musical vocabulary and tireless dedication ensure him a place in the dynasty of forward-thinking techno transplants.Alongside Lee Curtiss and Shaun Reeves, Ryan is responsible for running VisionquestRecords, one of dance music’s most cherished and eclectic imprints. Ryan and hispartners in Visionquest have honed a whole new landscape of lush, organic techno and esoteric leftfield electronica. In 2014, Ryan helped oversee the construction ofVisionquest’s newest ventures —their digital arm and sub-label Brachtune, as well asVisionquest Special Edition, a vinyl only imprint that leans towards the kind of afterhours, dubby tracks that will remind long-time friends and fans of Ryan’s early morning sets in the notorious “Tesh Club” basement.An enthusiastic and hardworking DJ, Ryan crisscrosses the world both as a solo act and as part of the Visionquest trio. He’s played at the world’s best clubs across sixcontinents. Starting with the Visionquest DC 10 takeovers in 2012, his long-standinglove affair with Ibiza grows ever stronger, with regular appearances at Marco Carola’s Music: On, CircoLoco at DC10 and Luciano’s Vagabundos events.2016 sees big changes and new goals for Ryan. A move back to the States finds himsettling in Brooklyn, New York with a mind to head back into the studio for multiplelong term projects. A second album with long time friend and partner Cesar Merveillewill see the pair continuing to mesh live classical and jazz musicians with modular andanalog based electronics to create a unique twist on contemporary electronic music. Further material will be released on DJ Three’s Hallucienda imprint as well as acollaboration with Livio & Roby for their Desolat long player and all new originalVisionquest output will surface surrounding the trio’s 5 Years of Visionquest tour whichtakes them across the globe to hot spots in Berlin, London, New York, Paris, Tokyo,Amsterdam and much more.A recent move back to the States finds him settling in Brooklyn, New York with a mind to head back into the studio for multiple long term projects. In addition to EPs on Hallucienda, Visionquest and Roche Madame a second album with long time friend and partner Cesar Merveille is in the works. The new album will see the pair continuing to mesh live classical and jazz musicians with modular and analog based electronics to create a unique twist on contemporary electronic music. Ever-present on the Romanian, and not only, electronic music scene, Cap is one of those artists that would spice up any line-up. Eager to asser himself, he went from listening to music to being an audiophile, from being a vynil collector to a DJ. The transition took place in 2010 and his evolution has been upward ever since.When mixing, he can easily feel a complexity of feelings, being almost empathetic with his public and adapting himself so naturally to the vibe of the party. Thus, he expands on a very vast musical area, from old-school house to local techno, each genre being correlated to the vibe that the public generates.Over the past years, his versatility and music selectionx took him on some of the most important electronic music stages, such as GuestHouse or Space in Bucharest, up to Ibiza Zoo Project, Ibiza Underground, Sunwaves 12 daytime party or Sunwaves 15 opening. He has perfomed as a warm-up act for artists such as Thomas Melchior, Dorian Paic, Moritz Von Oswald, Francesco del Garda DeWalta, Troy Pierce, Bill Patrick, Anja Schneider, Valentino Kanzyani or Raresh. Other notable moments are mixing back to back with Cezar, Barac, Kozo, Praslea, Gescu, Cristi Cons or Dan Andrei and so on.